Eventually the couple came across a terraced house in Notting Hill and were struck by its huge potential. ‘It had permitted development to create a basement and there was a partially renovated loft,’ says Tatiana. ‘But it had been rented out and was looking a little neglected, with an overgrown garden. 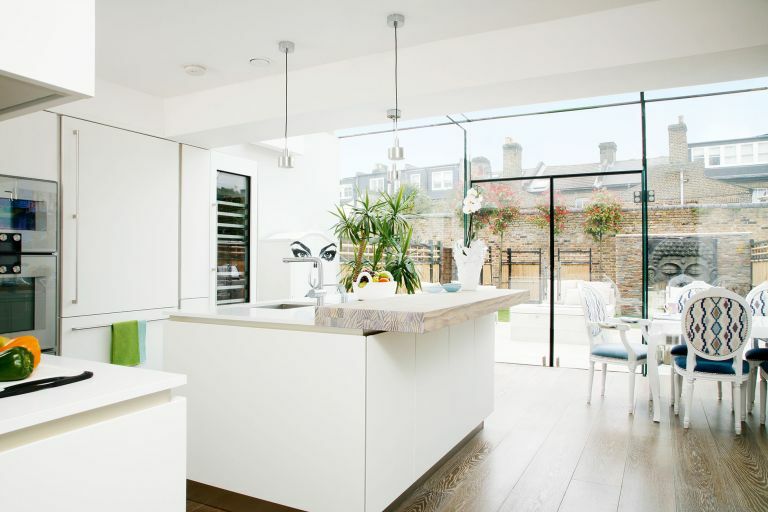 Find out what they did next, then browse through more real home transformations and discover more about extending a house. ‘First, we hired a structural engineer to assess the viability of excavating the basement. He said it would be a challenge, but possible.’ It now includes a cinema room, home office, utility, two bedrooms, as well as a wellness suite with Jacuzzi. To find tradespeople, Tatiana asked for recommendations from the builders who had refurbished her salon not long before, and, once an architect was appointed, he made further suggestions. Shawn visited the site every day to oversee work. ‘It was pretty much an empty shell as most of the internal walls had been removed,’ says Tatiana. When the excavation began, water started to pour into the space, and had to be pumped out while the cement base was poured. ‘We couldn’t predict how long the work would take, and at times it moved slowly, but after seven months things started to take shape.’ On the ground floor, the living room was kept at the front while the old conservatory was knocked down and replaced with a glass-box structure. ‘A steel beam across the rear has allowed the space to be completely open to the kitchen in the middle,’ says Tatiana, ‘and a wide walkway makes the front living room feel part of it, too. The kitchen company advised on the best layout. ‘I knew I wanted a sink in the island so that I could chat to Shawn and friends while preparing food,’ Tatiana says. The space has been enhanced immensely by well-thought-out lighting. The couple sourced all the lighting online, and supplemented their fixed fittings with freestanding table and floor lamps to create atmospheric pools of light in the evening. ‘I like to mix up styles,’ explains Tatiana, ‘so we went for a modern dining table and combined it with Victorian chairs, which I painted and had reupholstered. Once the kitchen had been completed, Tatiana and Shawn could think about linking the kitchen-diner to the outside.